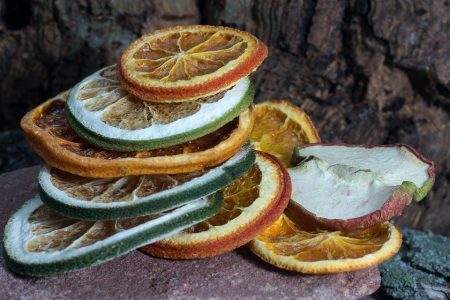 How long a particular food should be dehydrated is the most asked question for any beginner and intermediate dehydrator users. If you want to try out the latest fruit leather recipe or make beef jerky at home, read on to know more about complete dehydrating times for different types of food. If you are looking for maintenance of nutrition in food, and preventing its enzymes from dissipating, dehydrating food is the best solution. Enzymes or protein molecules which add nutritive value to food are preserved if the dehydrator is used. While some dehydrators such as the Ronco brand take days to dehydrate food, others like the Nesco model with Converga-Flow patented technology dehydrate items in hours. So you save a lot of time. 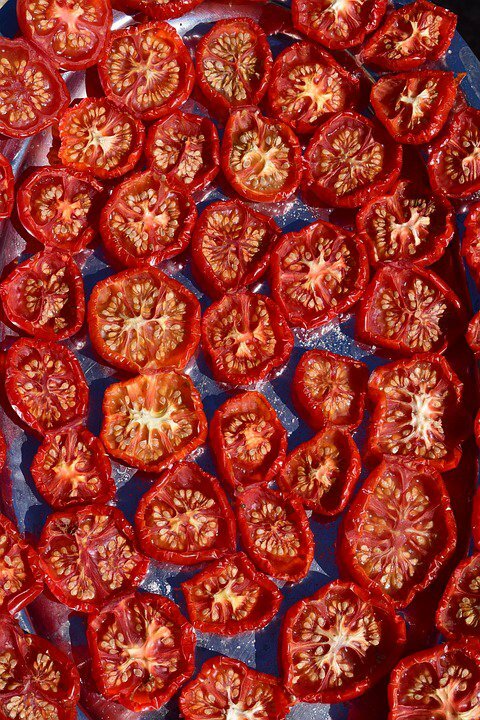 Dehydrating foods below 110 degree F is perfect for retaining its color, nutrition and aroma, according to nutrition experts. 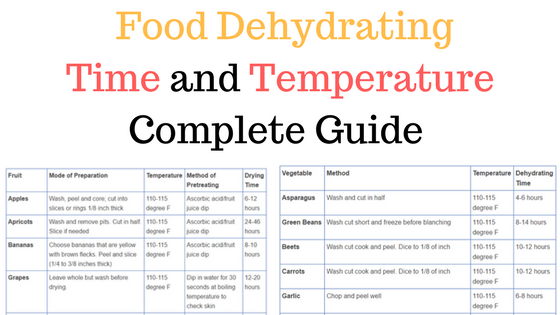 Let’s delve deeper into the different time duration it takes for food to be dehydrated. After all, neither are fruits, vegetables, herbs and spices, jerky or leather prepared the same way nor are they dehydrated for the same period of time. Why Difference Dehydrating Time for Different Food Items? Dehydrating food is the best way to preserve i﻿ts nutrients. Enzymes are an important part of food items because they assist the body in digestion and other processes. By using a food dehydrator, the nutritional value of food is preserved. How does this come about? The process of dehydrating removes water by warming food at low temperatures enabling the food to preserve its nutritional value while changing in texture, longevity and provide variety in food choices. Whether you are dehydrating fruits or vegetables, herbs or spices, there is a difference in the dehydration time, because food is farmed and harvested in different quantities and contains differing levels of moisture and fats. Food is preserved using a dehydrator by decreasing moisture content and slowing down the bacterial growth and spoilage thereby leading to a long shelf life. The fruits increase in sweetness as a result of dehydration, because the water is removed. 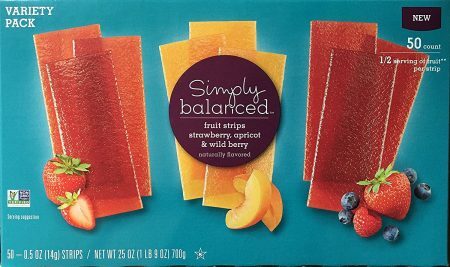 The dehydrated fruits and fruit rollups make for the perfect substitute for sugar and refined sweeteners. Vegetables that are dehydrated work well as snacks or as added to salads, cold soups and much more. Vegetables and fruits, nuts and seeds can be dehydrated along with fruits to make toppings, crackers, granolas, spread, breads and crusts. Water content and acidity are limited factors for dehydrating foods. Water content comprises the moisture level of food. Water activity or the amount of water in food is the main target of the dehydrator. Varying amounts of moisture content means dehydrating times differ. Available water is the water not chemically bound to the food and available for microbes to use. Consider that the water activity of pure water is 1.0, dry cracker is .2 and so on. At lower levels less than .85 water activity, bacteria and other mold cannot grow. Acidity is the pH level or level of hydrogen ions. A low pH level of 3.5 and less is completely acidic while high pH of 8.5 or more is alkaline. A pH value of 7 is neutral. If the food is .85 or below in water activity and pH level is 4.6 or below, it has a long shelf life. While sugar and salt lower water activity level, vinegar acid decreases the acidity of food. How do you make out when someone is done or dehydrated completely? Break apart the food and if it is still dark in the center or wet compared to the external part in that moisture in the inner part of the food is high, the food is not done. Dehydrated or dried food should be stored in dry, dark and cool area. Recommended storage time ranges from as low as 3 months to as high as 1 year. The higher the temperature, the shorter the storage life– this is the general thumb rule (1). Foods that are high in fats or not completely dehydrated have a lower storage life and need to be stored in the fridge or freezer. Rule 1: Thinner items dry more rapidly than thicker ones. This is because the water content in thinner foods is less so it takes less time to dehydrate. The thicker items, on the other hand, require longer duration of heating for the airflow to penetrate the interior of the food. Rule 2: The greater the sugar content, the higher the drying time. Sugar content also raises dehydrating times. So, foods such as fruits high in sucrose and glucose will take a longer time to dehydrate than less sugary items like herbs. Rule 3: Fat raises the dehydrating time and risk of spoilage. Fat content is high in certain foods like meat jerky which raises dehydrating time and causes risk of spoilage. High humidity means there is more moisture in the air. So dry air is harder to generate within the dehydrator and moist air also comes into contact with the food, causing the water levels to rise. Rule 5: Dehydrators with fan dry food faster than those without fans. Fans circulate the heated air evenly across the dehydrator trays and ensure uniform, even drying. This makes models with fans a better investment, if you want to dehydrate food quickly. Leave whole but wash before drying. Wash, slice and cut into 1/4″ thick. Generally, cut fruit is dry when it can be folded in half without sticking to its inner portion. Once the drying is over, the fruit should cool an hour before packing. If it is not, sweat and moisture build up can take place. But don’t wait beyond this to package the dried air as humidity can cause moisture to enter the fruit (4). When you dry veggies in a dehydrator, you need to check the quality of the final product. If it takes exceptionally long to dry the vegetable, its flavor is lost. To lower the time needed to dry vegetables, they should be cut into small pieces. Vegetables need to be dried till they are brittle and contain only 10 percent moisture. No germs can thrive in the dried veggies as a result of this. The table below shows how some vegetables are better for drying than others at 110-115 degree F.
Wash and peel. Cut into strips that are 1/4-inch thick or into slices that are 1/8-inch thick. Always dehydrate foods with clean hands and on clean trays. The vegetables should be thoroughly washed before drying. Trim, slice and peel vegetables, removing the rotten or damaged areas. Slices should be kept in uniform piece. Dry vegetables should be dehydrated once picked from the garden and purchased from the store. If they are in the fridge before drying, the quality of the vegetables will lower and nutrients will be eliminated. Pre-treating the vegetables requires blanching with steam or boiling water before dehydrating it. This heats the vegetables to temperatures high enough to stop enzymes that trigger loss of taste and color. But some veggies do not require blanching before dehydrating. These include green peppers, mushrooms and onions. Most vegetables need to be blanches with either steam or water. Cooling and drying the vegetables after blanching is important. This prevents the cooking action that is caused by hot water. The vegetables must be trained and slightly hot to touch when they are placed in the dehydrator in a single layer on the trays. Veggies tend to dry more rapidly towards the close of the dehydrating period so they need to be carefully watched (6). Conditioning is not required as the vegetables contain just 10 percent moisture. Veggies with strong odors should be separately dried to prevent flavor mixing (7). The easiest method of preserving ﻿﻿﻿﻿herbs and spices, so that they do not lose their potency is to dehydrate them. Herbs and spices take anywhere from 2-4 hours to dehydrate at 110 to 115 degrees F. The best time to harvest the herbs is when they are harvested. When the flowers are at the bursting bud stage, the herb should be harvested. Rinsing the herbs in cool water once they have been collected and shaking them to remove excess moisture is important. Discard bruised, damaged or soiled leaves. Pre-heating the dehydrator with 95-115 degree F thermostat is essential for best results. Areas of higher humidity may even require preheating of more than 125 degree F. Herbs need to be placed on a single layer in the dehydrator trays and periodically checked. 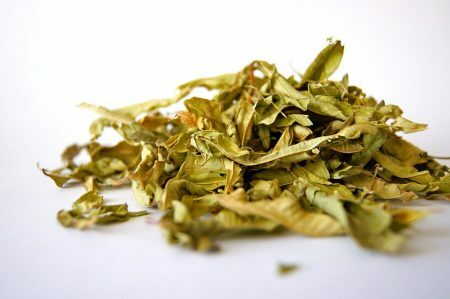 Herbs are dry when they easily crumble,and stems are broken when bent. Less tender herbs are easiest to dry and they dehydrate faster. This includes rosemary, sage, thyme, parsley and summer savory. Tender leaf herbs like lemon balm, mint, basil, oregano and tarragon will spoil if they are not dehydrated and take longer to dehydrate on account of higher moisture content. Dried herbs are usually 2-4 times stronger than fresh herbs. They are also easier to store. A lightweight, dried meat product, jerky is the choice food of campers, sports enthusiasts and backpackers. Jerky can be made from lean meat. This includes beef, pork, venison or smoked turkey. Raw poultry or chicken jerky is not recommended because the texture and flavor of the finished product is not satisfactory. To treat the meat, freezing 6 inch portions or less at 0 degree F for at least 30 days saves the product from bacteria. This includes raw meats like high protein beef, venison etc. Clean hands and utensils are important. Meat and poultry should be kept at 40 degree F. Using ground beef and poultry within 2 days, red meats within 3-5 days are necessary. If you are using fresh game for making the jerky, check the meat is clean of wounds. Thoroughly cooked meat should be dehydrated, if the game meat is being dehydrated. Meat should be sliced at ¼ inch and not be containing any fat. Excess fat makes the jerky chewy and rancid. The dehydrator offers meat jerky within 10-24 hours at 140 degree F.
Samples heated in marinade dry quicker.If strips are not heated in marinade before dehydrating, they should be heated after drying in an oven for a safety measure at 10 minutes in 275 degree F preheated appliance. Though thicker strips may require additional drying, there are different steps when it comes to making jerky from ground meat. Special presses are needed for forming or shaping the product. An internal temperature of 160 degree F is necessary for eliminating disease causing bacteria. Using a calibrated thermometer, you need to monitor the air temperature of the dehydrator. Pre-heating the dehydrator to 145 degree F for 15-30 minutes is essential. Well dehydrated jerky is leathery and brittle but won’t snap. The dehydrating temperature for jerky ranges from 160 to 165 degree F.
Fruit leather is made from drying thin layers of fruit puree in a dehydrator. Fruit leather takes 4-10 hours at 140 to 145 degree F for drying properly. Dehydrating fruit leather is simple. The properly dried fruit leather lacks opacity and is easily peeled from the pan though tacky to touch. Drying thin layers of pureed fruit called fruit rolls or taffies, fruit leathers are whole and nutritious snacks for those on the go. Many combinations of fruits can be made into fruit leather after being placed in a blender to gain mash like consistency. This includes apricots, apples, grapes, berries, bananas, oranges, pineapples, plums, peaches and melons. 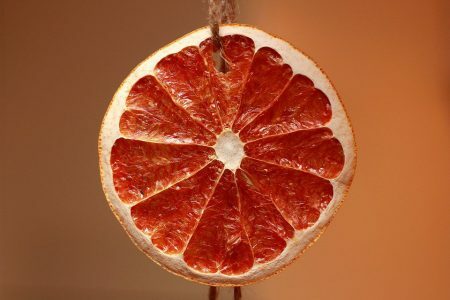 It is best to heat the fruit before drying to 160 degree F as well, Preheating stops enzyme action maturing preserving the natural color of fruit and speeding up the drying process (9). Dehydrating different types of food items is easy provided you follow the proper procedure. Dehydrator drying times vary across models and brands of dehydrators. Depending on whether the dehydrator has a fan or not, whether it is an economy or premium stackable model or a vertical dehydrator, this can make a difference to the drying times. Equally important is the positioning of the trays and whether these are switchable, stackable and easy to position. Dehydrating food is simple and one of the best ways to preserve its nutritious value. Buy the right dehydrator and opt for speedy drying times for your fruits, vegetables, leather and jerky as well as herbs and spices. Where to Buy Nesco Dehydrator? Some users recommend blanching strawberries before dehydrating but What I feel is, it’s really not necessary. It’s simply a waste of time. Hi! I just got a dehydrator for christmas! I’ve dried apples thus far. Im wondering – craisins and some other dehydrated fruit i get at the store are still tacky and pliant. But in the books and this blog it says the dried fruit needs to be able to break, not bend. How do i make sure it’s dried enough to be safe when i store it? And how will i know if it turns bad when i store it? Congrats on getting a dehydrator! Each fruit has there own dehydrating time and temperature setting which you could try for dehydrating it. If you remove water content from the food item, then you are good to store it. There is no hard rule to find out whether it’s dried or not. We have to do rough estimate whether it’s dried or not by seeing the food item. I will answer that question in the upcoming post. I want to use dehydrated spinach powder in bread . I tried .i mixed spinach powder in dough. Bread tests dry after 2-3 hrs. I think you are missing some steps/ingredient in the bread making process. I guess it is something to do with yeast I guess. This is an EXCELLENT source of information for the beginning and advanced dehydrator (person). As soon as I finish my comment, I’m going to add this site to my favorites list. I know it took you a long time and a lot of work to build this. Thank you so much! Thanks for your kind comment, Jim Connor. Only a few people recognize our hard work. Thank you for this information. I used to dehydrate and now am just getting back into it. I have noticed though, that most of my searches this time have come up with much higher temperatures than I was used to before. In fact I understood that 105 degrees was the best temp for drying most things in order to preserve nutrients. So I am glad I found your page–at least you recommend 110 degrees. So I think I will use your info as a guide along with the older books I have at home. My prime purpose is to preserve the best quality, organic foods in such a way as to retain the most nutrients. So, thank you. You’re welcome, Nancy! Good to know you are back to dehydrating. What temperature would you recommend drying thicker leaves like mango, guava, and soursop? We updated mango and guava in our article. For soursop, we are not aware of dehydrating time and temperature so we left that. Linda on Can You Over Dehydrate Food? Kelsey on Can You Over Dehydrate Food?